In My Cup: Pre-Weekend Ponders. I’m in love with finding cool reads, especially ones that plenty of us (20somethings) can relate to- like this and this-awesome articles. I’m pretty much addicted. With all the rain and dreariness, somehow I have found myself looking through fall-ish inspired looks, in a few months everything about her/outfit aura will need to be in my life. ‘Mapple Bacon Cookies.’ while flipping through the always amazing Garden &Gun. p.s…they’re maple-baked apples with sort-of-bacon. Heavenly. vegan & gluten free made with this wonderfulness. Recipe soon? Yes. ‘Chic’ Flicks (yes. I did spell it that way to be awesome. ): A new go-to amongst ‘The Notebook’, ‘P.S. I Love You’, and ‘When Harry Met Sally’- for rainy days in, of course. Best pink for summer: ‘Pin Up Pink’ Pop Beauty. + cozy blankets. Love this App, subscribe. You won’t regret it if you love to write. I’m going to the beach next week, and this little beauty is wonderful to help with UV recovery. It is full of skin brightening and healing goodies- like peptides that help with anti-aging and any dark spots, while also using Apple Stem Cells known to keep skin bright and healthy. Plus it smells like Apple Whiskey…for your face! I’m sorry, but who can beat that? I’m already a week in, and I braved up and took a kind-of clear sans-makeup picture to show some results. Love. Rainy days and little French bistros are a delicious combination. If you’re ever around Charlotte, NC, this is a pretty cute place to try out. Have a lovely, and hopefully sun-filled, weekend. xoxo, Laura. 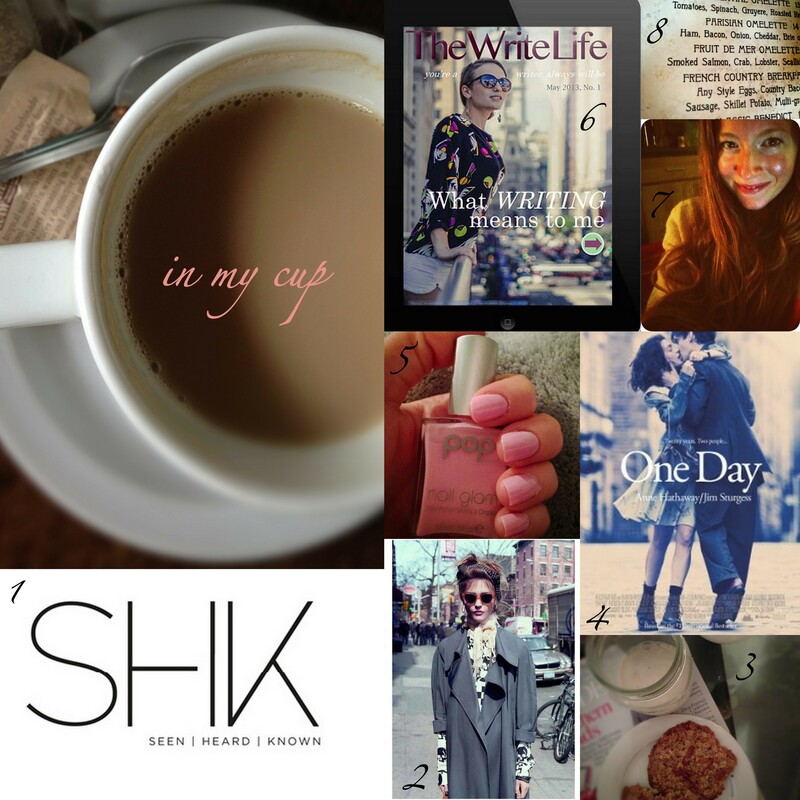 Author thepureandpinkelephantPosted on June 7, 2013 August 3, 2013 Categories Let's Be Stylish: Fashion, Let's Eat: Recipes, Let's Go To Wonderland: In My Cup PostsTags Adore, app, apple, apple stem cell brightening serum, favorite things, Garden & Gun, healthy eating, inspiring articles, looks, love, mychelle, natural, novel, One Day, seen heard know, shk magazine, style, The Write Life, top, weekendLeave a comment on In My Cup: Pre-Weekend Ponders.